Lets face it - when you see a monkey - you smile. It doesn't matter what your mood, where you are, or anything... you smile. When I received a call about getting some ideas out for a one year old birthday party invites, and to have monkeys on it... I instantly smiled... they are so cute. 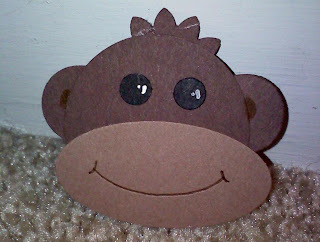 Next I had to immediately pull punches out and create, since I do not have a monkey of sorts in my collection. (I know my kids were amazed too!) So this is what I have completed... and nothing further. 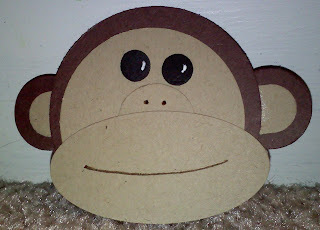 I did think about some bananas for the monkey, but they bunch that I made weren't working well for this size monkey. With those ideas aside, I headed to bed. Little did I know I would have to publish the monkeys to get a vote on the cutest one, since no one in the house could possibly decide which one they liked best. The four of them together. 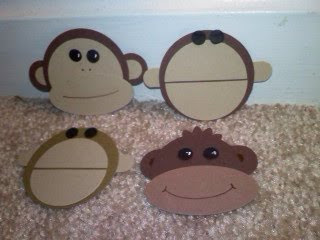 Next I have to put the dam monkeys on card... but they are cute, so I will be smiling while I do it. I think I can make it work, afterall my other chores to complete are baking banana bread (merely a coincidence) and apple crisp. Plenty of time to play while they bake away! Have a great Wednesday! Can you believe its almost OCTOBER??? wowser! Oh, I think the monkey with the hair on top of its head is way too stinkin' cute Chera!